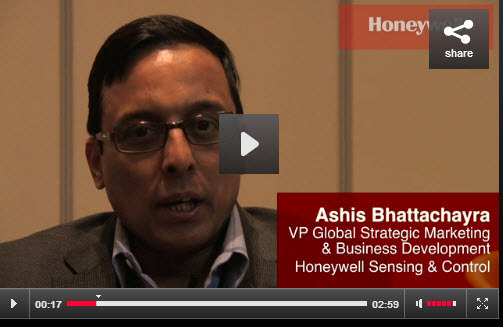 Watch as Ashis Bhattachayra, VP Global Strategic Marketing & Business Development at Honeywell Sensing & Control, explains how the company differentiates itself from competitors. He also demonstrates how Honeywell's difference leads to new products such as TruStability board mount pressure sensors that can combat drift in a variety of applications, from medical to industrial. Ashis Bhattachayra, VP Global Strategic Marketing & Business Development at Honeywell Sensing & Control, explains how the company differentiates itself from competitors. He also demonstrates how Honeywell's difference leads to new products such as TruStability board mount pressure sensors that can combat drift in a variety of applications, from medical to industrial.